Fast growth to 60 feet. Medium to dark green leaves turn yellow in fall. Grows best in well drained soil. Once established will thrive in dry, sterile soil. Transplants readily and because of its adaptability, may be used for along streets, lawns, commercial areas, parks and golf courses. 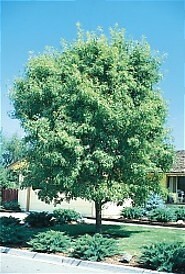 The most widely distributed Ash in North America. No shipments to AL,AK,AZ,AR,CA,CO,CT,DE,FL,GA,HI,ID,KS,LA,ME, MA,MN,MS,MT,NE,NV,NH,NM,NC,ND,OK,OR,PR, RI,SC,SD,TX,UT,VT,WA,WY.